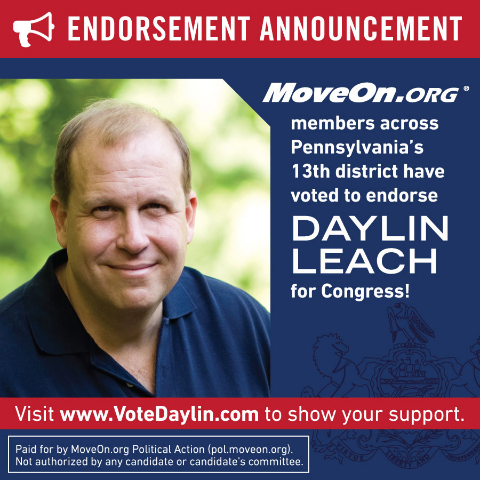 State Senator Daylin Leach is the candidate for the U.S. House of Representatives in Pennsylvania’s 13th congressional district who best reflects democratic as well as Jewish values. Senator Leach’s long and unwavering record of support of women and families is well known, and he will continue to work to uphold and defend the civil rights of all people. He supports increased funding for our public schools as he believes all children need and deserve a good education. He understands, as do we, that the path to economic prosperity lies in providing our children with the best education possible. Senator Leach also has championed a pathway to citizenship for the 11 million undocumented immigrants who live in this country. Such a pathway is both a Jewish and American value and is good for the prosperity of our nation. He also is a passionate supporter of a strong and a secure Israel. We believe that Senator Leach will be the best advocate for the constituents of Pennsylvania’s 13th congressional district. We are pleased to add our voice to those of the many others who look forward to his victory in the May 20 democratic primary.